Bloom Racing, Madaket Stables and Allen Racing's Midnight Bisou was officially declared the winner of Saturday's Grade 1 Cotillion, moved up after the disqualification of first-place finisher Monomoy Girl. The latter crossed the wire a neck in front, but was taken down for interference throughout the stretch run. Midnight Bisou, trained by Steve Asmussen and ridden by Mike Smith, got her second G1 win at odds of 5-1. The final time for 1 1/16 miles over the fast main track was 1:45 4/5. 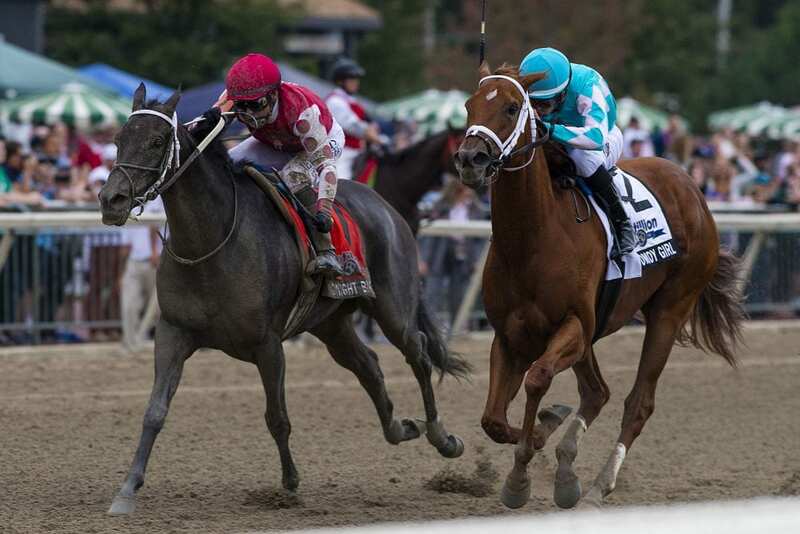 “We were just so happy with her coming out of the Saratoga meet with five-weeks rest, we thought she came in here really fresh and on her game,” said Asmussen's assistant trainer Scott Blasi. “Tough to win like this, lose like that, we've all been there, but that being said she deserved to win the race. 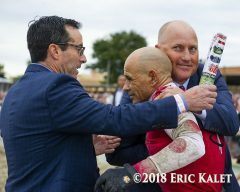 Mike Smith and Scott Blasi celebrate with Jeff Bloom after Midnight Bisou is declared the winner. After the finish, Smith put in a claim of foul with the stewards as Monomoy Girl was drifting in and then out, and after a lengthy review Midnight Bisou was moved up to the winning position. After a fairly even beginning, Monomoy Girl was at the rail in a good stalking position behind the frontrunning Jump Ruler. Midnight Bisou was a bit farther back, well on the outside in about fifth through early fractions of 24 seconds flat and 48 3/5 seconds for the quarter and half-mile splits, respectively. Though Separationofpowers made a premature move to take the lead heading into the far turn, Geroux was quick to respond with a rally on Monomoy Girl. She took the lead heading into the lane, but Smith found an inside shortcut to put Midnight Bisou back into the race. Smith began his stretch run on the inside, but Monomoy Girl drifted in and forced him to switch paths to the outside. Then, Monomoy Girl continued to drift out slightly down the stretch, forcing Smith and Midnight Bisou wider and wider all the way to the wire. Though Monomoy Girl crossed the wire a neck in front, she was disqualified by the stewards and Midnight Bisou was officially declared the winner. Wonder Gadot finished third, and Separationofpowers was fourth. It is the first loss of Monomoy Girl's season, which has included wins in the Kentucky Oaks, Acorn, and CCA Oaks. Bred in Kentucky by Woodford Thoroughbreds, Midnight Bisou was an $80,000 purchase at the OBS April 2-year-old in training sale. She She broke her maiden in her third career start, the G2 Santa Ynez Stakes, and two starts later added her third win in the Santa Anita Oaks. Third in the Kentucky Oaks, Midnight Bisou came back to win the Mother Goose, but had been twice defeated by rival Monomoy Girl until the Cotillion win. Overall, Midnight Bisou boasts five wins from 10 starts and earnings of over $1.4 million. This entry was posted in NL Article, Racing and tagged brad cox, Cotillion, Cotillion Stakes, Florent Geroux, midnight bisou, mike smith, monomoy girl, parx, Parx Racing, tapizar by Paulick Report Staff. Bookmark the permalink.